All elements of the Party Grill® can fit inside the device.Thanks to its detachable legs and lockable lid it is easy to transport and store. 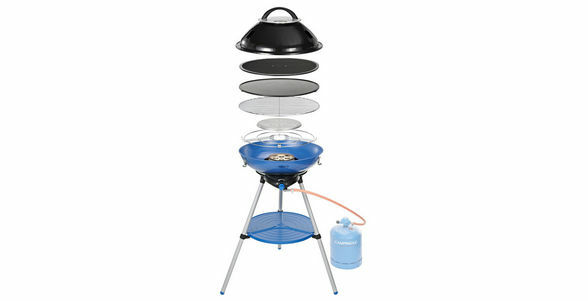 The Party Grill® 600 runs on conveniently sized Campingaz cylinders. The piezo ignition promises simple, match free lighting wherever you are, so you can get the party started. Get the party started with the Campingaz Party Grill®, the essential campsite and festival companion! The Party Grill® family comes with numerous accessories included ensuring you have endless cooking options. The Party Grill® 600 comes equipped with a pan support, grilling grid, reversible cooking griddle and a large lid with thermometer for convection cooking. The Party Grill® 400 model comes with the same versatile accessories as the 600 but in a more convenient size. The lid of the Party Grill® 400 doubles as a Wok when reversed. The Party Grill® 200 offers a pan support and an enameled grid and runs off a CV+ 470 cartridge for extra transport convenience. Sizzle or cook all your favourites on one versatile Party Grill® with all cooking accessories included. The Campingaz Party Grill® family is especially compact and easy to transport. All components of each of the stoves pack away inside the stove to make one very convenient unit. Even the legs of each model are easy to assemble/disassemble and fit within in the water compartment of the grill. The Party Grill® 400 and 600 models come equipped with a handy carry bag, ensuring transportation and storage is a breeze. The Party Grill® 200 includes a protective lid that simply clicks on to the top of the stove, protecting all components. The Campingaz Party Grill® range is especially easy to clean. Designed with a water compartment, this compartment catches any grease and cooking juices and prevents these from sticking to the stove. When finished, simply discard the dirty water and rinse off with soapy water. The pan support, grids and griddles are dishwasher safe but can also be easily cleaned with a sponge and soapy water due to their non-stick surfaces.